Shareholders of Embraer on Tuesday approved the company’s proposed strategic partnership with Boeing (NYSE: BA) during a meeting held in Brazil. Boeing said Tuesday shareholders owning 67 percent of Embraer’s outstanding shares participated in the meeting with 96.8 percent voted to approve the transaction. 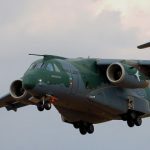 Embraer stockholders cleared the proposal to develop new markets for the KC-390 military transport aircraft under a joint venture in which Boeing will hold a 49 percent ownership stake. The shareholders also approved the plan to form a commercial aviation-focused JV. Under this JV, Boeing will own 80 percent of the business and Embraer will hold the remaining stake. Embraer will continue to independently run the KC-390 multimission airlifter program and commercial aviation business until the completion of the transaction, which is expected by the end of 2019. The shareholder vote came a month after the government of Brazil approved the Boeing-Embraer partnership.